This is the third page of a three and 1/3rd page sequence focusing on Helda. She may be a good Archonist, but she doesn’t seem to trust Dr Seward, last seen in Dark Horse Comics #15. We are re-introduced to him in a dramatic three-panel sequence culminating in the looming vertical close up of panel 3. I think it rocks, except I wish I’d been able to think of something else to so with the claw hand in the foreground; I find it really distracting. Maybe a different hand pose, say, holding the business end of the stethoscope to hook up with panel 4. In fact, I vaguely recall trying to draw that exact thing and giving up because it was too difficult. But I felt like the panel needed some foreground element. One of the things I love about Neal Adams and Gil Kane is the way they put hands in their close ups whenever possible, for precisely that reason. On the other hand, Seward’s close-up reminds me of “Ghastly” Graham Ingles’ EC horror work. I snagged his “Artist’s Edition” two weeks ago. 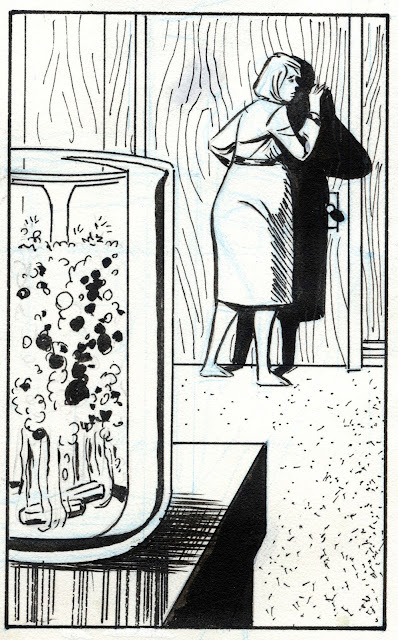 Talk about a superhuman inker. I also like the way I did the natural lighting in the room, with the strong daylight overcoming the artificial light. I made good use of the wood paneling to depict the plane of the wall falling away from the window. Ditto with the pile of the rug. 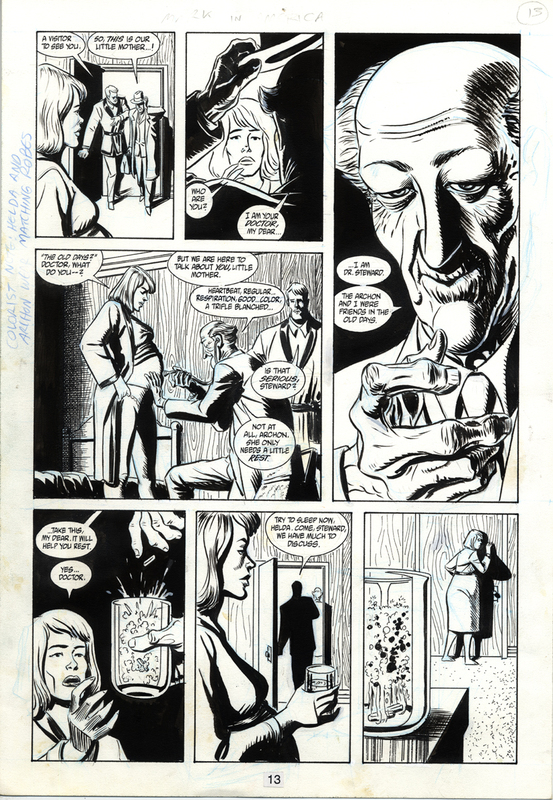 This is page 13 for "The Mark" issue 2, volume 2, otherwise known as "The Mark In America", published by Dark Horse Comics in January 1994. Written by Mike Barr, drawn by Brad Rader.